It is with a great deal of pride that the members of the Bayfield Lions Club look back on sixty-five years of accomplishments. One doesn’t have to look too far or too hard to see the part that Lions have played in making Bayfield a better place to live. In 1947, after a fire that leveled the Ritz Hotel and threatened the core of the village, the Bayfield Lions Club was formed. As a group formed with the goal to foster the Bayfield Area, they have made revolutionary changes to the community. Not only were they were the visionaries behind the creation of the Bayfield Area Fire Department, but, thanks to them, projects such as the Arena construction, Bandstand in Clan Gregor Square, and fundraising for the old Town Hall restoration, are made possible. In 2004, Bayfield Lions took over the Bayfield Municipal Building, which was formerly Bayfield Public School. They have revamped in into a lively community centre, bring together individuals with their diverse activities. Of equal importance is the more subtle role that the club has made to individuals and families in the community. These are acts of kindness and charity that are completed not for recognition or gratitude but rather because there was a need. Over a period of sixty-five years we can be sure that there are countless examples of Lions offering assistance when families were in need. So our pride in our history comes also from the Lions heart and the knowledge that we have made a difference to many, many people. See below for a wealth of Lions & Bayfield history. In 1947, the Bayfield Lions Club arose from the ashes of the fire that destroyed the landmark Ritz Hotel on Main Street and almost wiped out the entire village core. There was Fire at the Martha Ritz and no fire department or coordinated group to combat the blaze. It was fortunate that other buildings didn’t catch fire on that tinder dry Labour Day weekend. Bayfield at that time had a population of less than 350. A group of 26 community leaders realized that it was time to organize a group that would initiate and fund projects that would make Bayfield a better place to live. The Charter Members of the Bayfield Lions Club were: George Castle, Alex Rae, John Howard, Lloyd Scotchmer, Maynard Corrie, Grant Turner, Melvin Davidson, Charles Scotchmer, Arnold Makins, Reg Francis, Richard McDool, George Blair, Elgin Porter, Lloyd Makins, Ken Brandon, John Scotchmer, Rev. F.G. Stotesbury, George Little, J. Ernie Hovey, Charles Gemeinhardt, William Parker, Leslie Elliott, Spencer Irvine, High Gilmore, Rev. Laverne Morgan and Ken Merner. They understood that collectively they could achieve far more in their community by working together rather than as individuals. An organizational meeting was held in the Pavilion at Jowett’s Grove with Lions Club members from London, Zurich and Goderich to form a Bayfield chapter. Many of the Charter members of the new Bayfield Lions Club were descendants from area pioneers who were continuing the tradition of building a better community. These members ultimately contributed to the quality of life that we now all enjoy in Bayfield, Ontario. Their work changed, and continues to change, our community for the better. The first major Bayfield Lions community project was the promotion of a Bayfield Area Fire Department. The Department needed equipment, training and a fire hall before they could begin operations and the Bayfield Lions club became their major sponsor. To get the project started, the club hosted its first summer carnival and began a tradition that continued for many years. Most of the fundraising events staged by the Lions Club over the years are planned to not only raise money and add to the social fabric of the community, but to also attract more tourists which enhance and grow the local economy. Once the Fire Department had begun operations, the Bayfield Lions Club continued to allocate money each year to new equipment and then it started to look at other projects that would benefit everyone in the community. The Club turned its attention to the Fair Grounds and constructed a building to provide cover during the Fall Agricultural Fair and for winter sports. The Lions Club took a lease on the Fair grounds and their plans became more ambitious. They went over the grounds, fixed drainage issues and created softball diamonds. Volunteers worked hard to keep the grounds in good shape. Here, Bob Parker, Jim Cameron, Jack Fraser, Cliff Utter, Reg Francis, Charlie Scotchmer and Les Elliott cut the grass. The grounds are the home of the Bayfield Fair, an event that raises money for the betterment of our community, as discussed in the previous archive entry. Everything was done with volunteer labour. As Lorna Merner said about her husband, Bayfield resident Mert Merner who spent so much time working on the project; “They talk about golf widows, I’m an arena widow!” The Bayfield arena has been an ongoing project for the Lions Club. A community Centre addition was added in 1967, with again, all volunteer labour. Ice making equipment was installed to lengthen the skating and hockey season. Here Mert Merner on the ladder, Arnold Makins and Les Elliott, wearing the hat, are laying concrete blocks for the walls. The arena was the centre of activity year round, and served the community for 25 years until it was condemned by government authorities and a new one erected on the same location in 1978-79. The new arena was financed by government grants, the Lions and Lioness clubs and a house to house canvass of Bayfield residents. Whenever the Arena and Community Centre needed new equipment, the Lions Club has always been there to help. 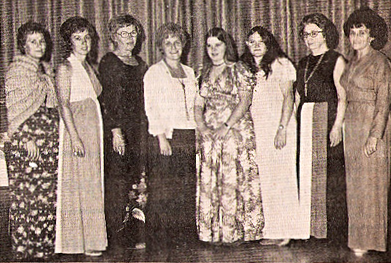 In 1976, the Lions sponsored the Bayfield Lioness Club which multiplied the good works carried on in Bayfield. Many of the Lionesses were spouses of Lions and women who had worked hard to support the Lions Club efforts over the years. 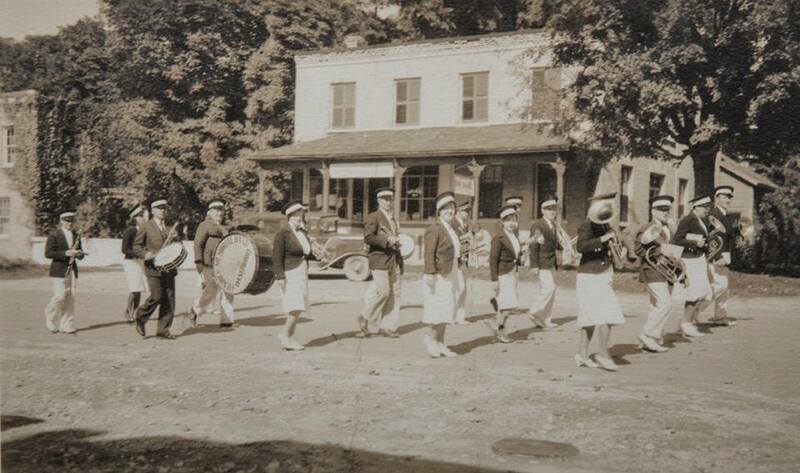 By forming their own club, they dedicated their efforts to other important community projects such as the building of the bandstand in Clan Gregor Square, benches and garbage bins on Main Street. The Lioness contributed more than $30,000 to the construction of the Community Centre. In a community that had a population of less than 500 people, there were over 60 Lions and Lioness dedicated to making Bayfield and the world a better place. An incredible portion of the population! In 1998, The Bayfield Lions Club hosted the first of its Home and Garden Shows at the Arena under the leadership of Lions Doug Sinnamon and Mike Sproul. Lion Larry Wainwright brought the idea and plans with him when he transferred his Lions Club membership from Fergus to Bayfield.